With a 5.25-inch screen, is the Grand 2 just a smaller Note 3? Not content until it has cornered every sector of the smartphone market, Samsung has announced the sequel to the Galaxy Grand, the aptly named Samsung Galaxy Grand 2. The Galaxy Grand 2 fits neatly between the Galaxy Note 3 and the Samsung Galaxy S4 in terms of screen size, although it comes with less power than both and without the Note's S Pen stylus. It does manage to keep the Note 3's faux leather back, though, along with a 1.2GHz quad-core processor, 1.5GB RAM, 5.25-inch HD screen and 8GB internal memory. In true Samsung tradition, microSD is also supported up to 64GB. This means an upgrade over the 1.2GHz dual-core processor and 1GB RAM that was found in the original Grand. Grand in name, grand in nature? The original Grand's screen has been stretched by 0.25-inches, gaining an improved HD 1280 x 720 resolution in the process. There is no AMOLED tech here though, with the TFT screen sat inside a 146.8 x 75.3 x 8.9mm chassis and weighing 163g. 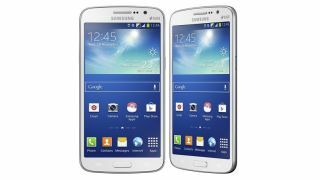 The Galaxy Grand 2 comes running Android 4.3 Jelly Bean, but doesn't pack the same 4G technology that made its way to the Samsung Galaxy Ace 3. Other key specs include dual-SIM, a 2600mAh battery, 8MP rear camera, 1.9MP front camera and Wi-Fi a/b/g/n. We are still waiting for pricing and an official release date, but it will make it to the UK and when it lands you'll be able to get your hands on a black, white or maybe even a pick version. Which one would you go for?